I’m always looking for easy and healthy instant pot recipes for my busy family, and this Instant Pot Chicken and Sausage Jambalaya fits the bill! 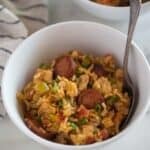 This easy jambalaya recipe is made with andouille sausage, chicken, uncooked rice, bell pepper, onion, celery and spices, all cooked together in just one pan, for a simple and flavorful meal that my entire family enjoys. When it comes to comfort food, any type of cajun or creole food ranks high on my list of favorites! 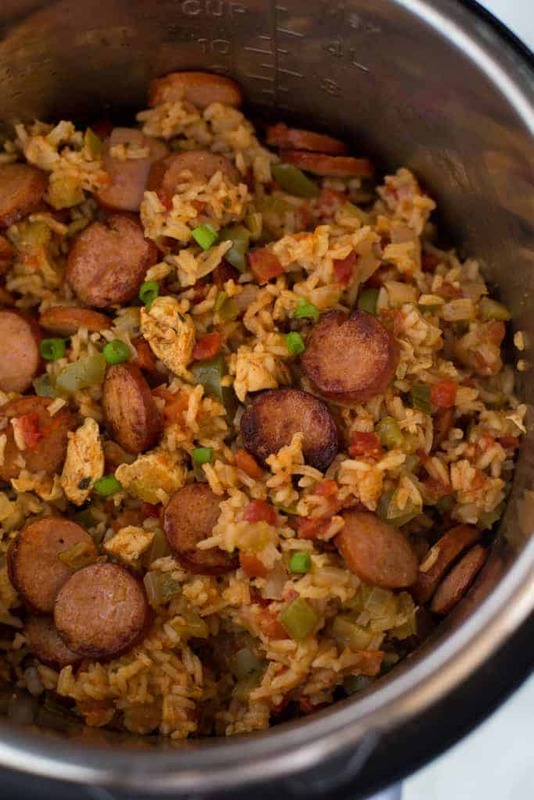 I adapted this jambalaya recipe from my popular one pan jambalaya that’s made on the stove top. It’s one of those easy and filling meals that I know my kids will eat with smiles on their faces, and thanks to the instant pot it comes together even easier than ever and has all of the same delicious flavor! 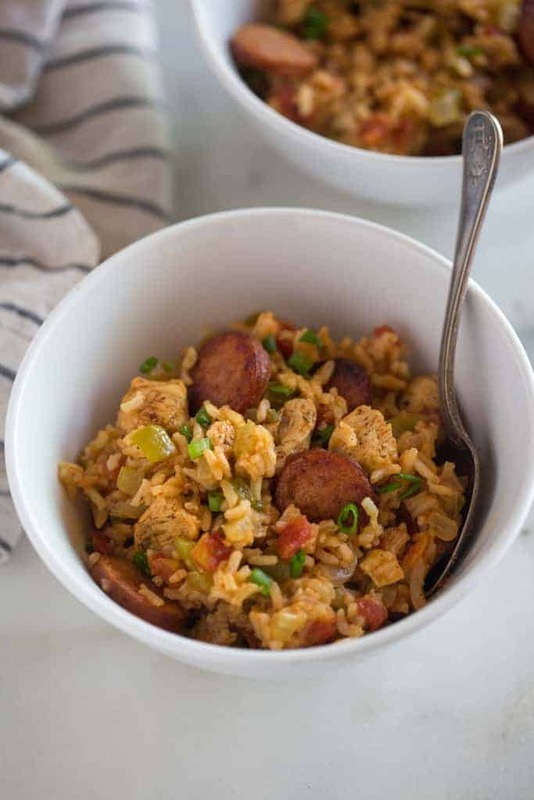 Jambalaya is a cajun recipe originating in Louisiana made with rice, celery, peppers and onion; with chicken and smoked or spicy sausage like Andouille. Shrimp is often added, too. 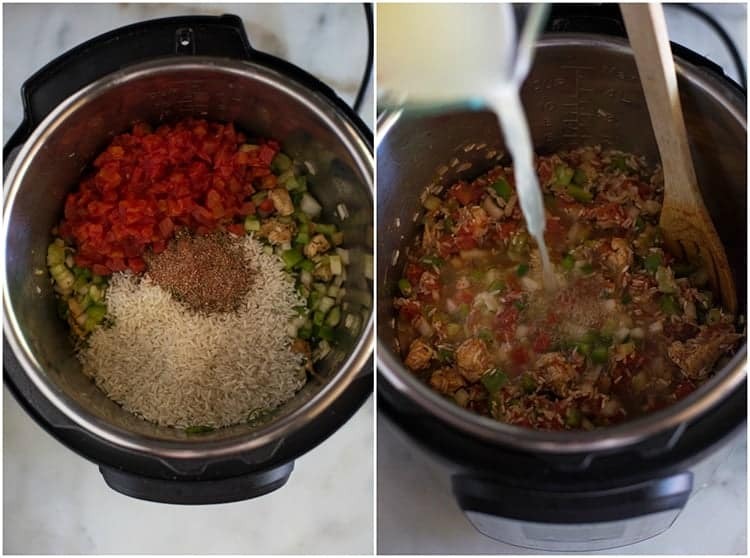 The ingredients in this jambalaya recipe include the “trinity” of green bell pepper, onion and celery, rice, diced tomatoes, chicken broth, spices, chicken and andouille sausages. What’s the difference between gumbo and jambalaya? 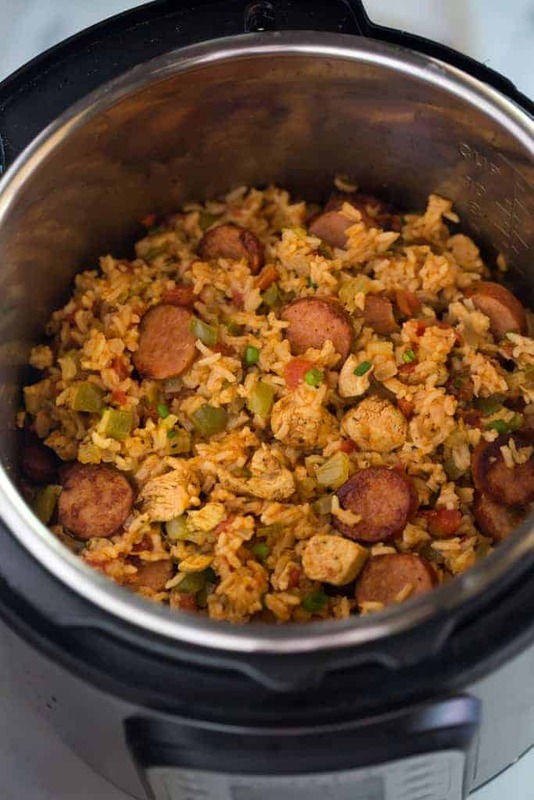 Although jambalaya and gumbo are both popular dishes made in Louisiana, they are different, and their cooking methods can be different as well, depending on whether they’re prepared cajun or creole style. Jambalaya is more of a rice dish, similar to paella (in looks, but not taste). Gumbo is more of a stew. Both contain what’s called the “holy trinity” of cajun cooking which is a base of bell peppers, onion and celery. Both also often contain sausage and shrimp. Homemade gumbo was one of my favorite recipes that my mom made for us growing up. Turn instant pot to the saute setting and add the oil. Once the oil is hot, add the andouille sausage slices and cook them until browned. Transfer them to a paper towel–lined plate. Add a little more oil to the pot, and then add the chicken, scraping up the browned bits from the bottom of the instant pot. Turn the instant pot off and add the onion, bell pepper, celery, and garlic. The instant pot will still be hot from being on the saute setting. We don’t need to saute the veggies for long–just a minute or so. Add the the spices and rice and stir to combine. Then add the diced tomatoes, chicken stock, and salt. Cook on Manual High Pressure for 5 minutes, with a 5 minutes natural release. Fluff the rice with a fork and add the sausages. I like to return the lid to let the rice rest in the residual heat for another 5 minutes. It helps keep the rice “fluffy” instead of “goopy”. If you don’t own an instant pot yet, you can make this jambalaya in just one pan, on the stovetop, with this recipe. 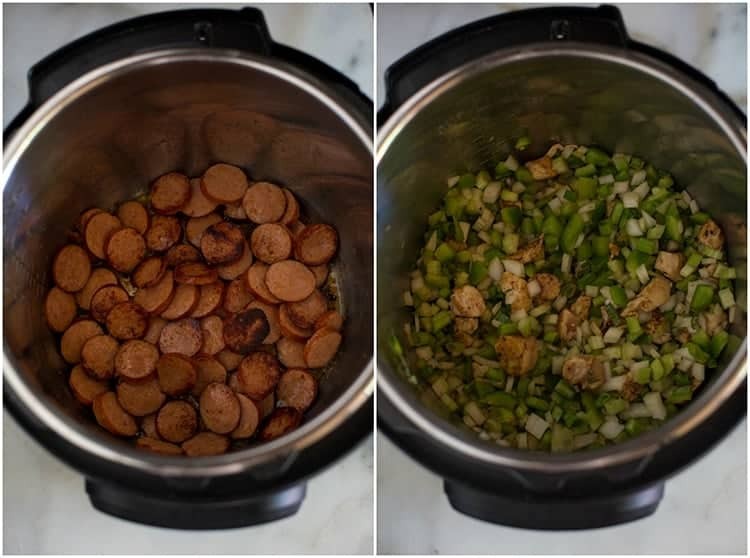 Instant Pot Chicken and Sausage Jambalaya made with andouille sausage, chicken, uncooked rice, bell pepper, onion, celery and spices, cooked in just one pan, for an easy dinner everyone will love. Turn instant pot to saute setting. Add oil. Once hot, add sausage slices, cooking until browned, about 2-3 minutes per side. Transfer to a paper towel–lined plate. Add remaining oil to the pot. Add the chicken and cook for one minute, scraping up the browned bits from the sausage. Turn instant pot off. Add onion, bell pepper, celery, and garlic and cook for one minute. Add the Cajun seasoning, dried basil, thyme, sugar and rice and stir to combine. Add the diced tomatoes and their juices, chicken stock, and salt. Cook on Manual High Pressure for 5 minutes. When the timer beeps, allow the pressure to naturally release for 5 minutes, and then quick release the remaining pressure. Carefully open the lid and gently fluff the rice with a fork. Add the sausages on top of the rice and return the IP lid to let the mixture rest for an additional 5 minutes. Stir lightly and enjoy! Made this last night, and it turned out great. Thank you! Thought it was pretty spicy. I would next time cut back on the cajun seasoning. How would I substitute brown rice in this recipe? Add about 1/3 cup more liquid and cook for 22 minutes high pressure, with a 10 minute natural release. Do you think brown rice would work instead of the white rice? Yes, you will just want to add more liquid–about 1/3 cup, and cook for 22 minutes on high pressure, with a 10 minute natural release. Enjoy! 1 chicken breast or 1 pound of chicken breast? What size instant pot is this for? 6 or 8 quart? I developed this recipe in my 6 qt IP.